Sometimes, after a long week of in-laws and nagging mothers, you just need a drink. Don’t get me wrong. I love my family. But there’s a reason I schedule visits to see my parents for just a few days at a time. SANITY. 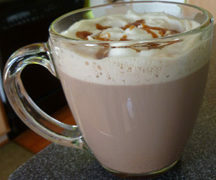 One way to relax and unwind, while re-centering yourself is to sip on a nice drink to help you calm the senses. 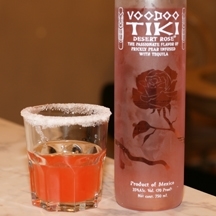 One option is to try a mixed drink or margarita made using Voodoo Tiki Tequilas. Made in Jalisco, Mexico, Voodoo Tiki Tequila is made from 100% Weber Blue agaves that have been aged between 10 and 12 years. After picking, the agaves are baked between 26-48 hours and then the tequila is distilled twice to ensure optimum flavors. Voodoo Tiki Tequila currently offers 6 different varieties of tequilas, with another two coming soon. From Platinum Silver to Anejo to the exclusive Private Family collection, Voodoo Tiki has flavors to tempt many palettes. I got to try the Desert Rose Tequila, which has prickly pear flavors infused into the tequila. If you get a close look at the Voodoo Tiki bottle, you’ll see that it’s frosted, etched glass. I love that this makes the bottle look as high quality as it tastes and it gives the tequila a very elegant look. Know that the pink color isn’t from the bottle – the tequila is actually pink. I was surprised when I opened the bottle because the tequila smelled a lot like white wine. I suspect that is from the prickly pear flavors that are floating around in the bottle. To sample the Voodoo Tiki Desert Rose Tequila, we tried it both straight up and as a a margarita using the Prickly Pear Margarita recipe below. When you drink it straight, it gives you a nice warmth all the way down to your stomach. It’s a lingering heat but it doesn’t burn like some strong alcohols. When we made up the margarita, we really weren’t prepared for the experience. The margarita was much more enjoyable and fulfilling than you’d expect from a tequila. The prickly pear flavor was evident and added a hint of fruitiness and crispness to the margarita. 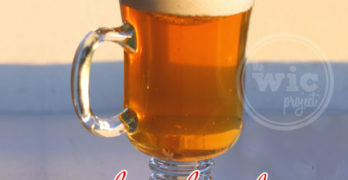 It was more flavorful and fresh-tasting than you would expect in such a potent drink. I could easily see myself throwing $12 or more down to buy this drink at a bar. My fellow testers and I really enjoyed the Voodoo Tiki Tequila. It was the perfect drink for sitting around the living room while talking and sharing stories about the week. For more information about Voodoo Tiki Tequila and to find out where you can purchase a bottle of your own, please visit their website at www.voodootiki.com. 2. Serve “Up” or “On The Rocks” in salted or sugar rimmed glass. Disclaimer: This post consists of my (and/or fellow tester) opinions only. No compensation was given for this review/giveaway. I did receive a free bottle of Voodoo Tiki Desert Rose Tequila from the manufacturer or the representing PR agency to use and test for the purposes of this review. This did not affect the outcome of this review. It was really tasty. If you get a chance to try it, let us know what you think!